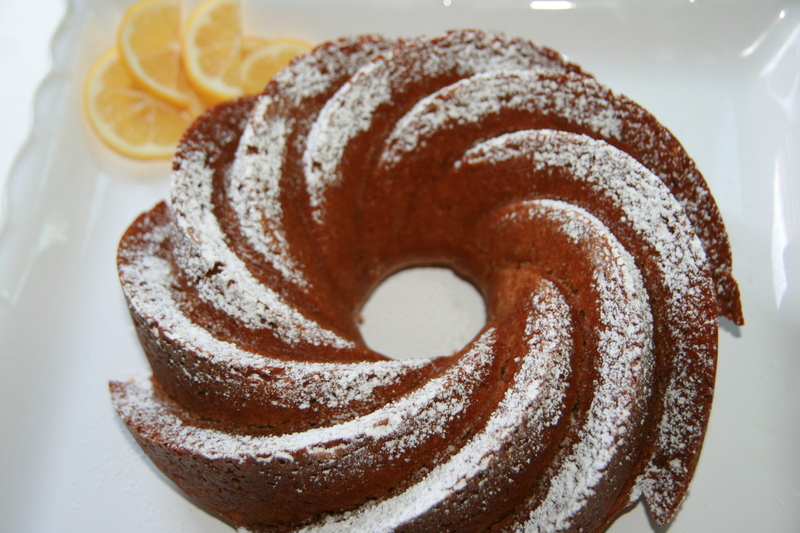 What could be better than seeing the look of pure joy on someone’s face when you bake them an awesome, beautiful, delectable Meyer lemon cake? Well, the fact that it took you only about 35 minutes start-to-finish makes it better. And for me, what makes the moment even sweeter is when I get to serve this yummy cake to a die-hard carnivore, knowing that in just moments when they’re moaning with joy, I get to see their jaws drop when I tell them that this cake is vegan…and healthy, and good for the environment, and good for animals! That’s right, this moist, delicious, lemony heaven-cake has no animal products at all. And since it uses olive oil to make it moist (which has a host of benefits, from helping to prevent strokes and heart disease to protecting cells from damage), and agave nectar as a sweetener (which means your blood sugar level won’t spike), it’s a healthy dessert. Without traditional animal-based cake ingredients, like eggs, milk and butter, it saves some chickens and cows while also being better for the environment. So bake the world a better and happier place by making this easy, super yummy crowd-pleaser that will make both carnivores and vegans smile. Happy holidays! * I like baking with whole wheat pastry flour since it makes desserts lighter and fluffier. I get mine at Whole Foods, but you can find it at most high-end grocery stores or health food stores. Preheat oven to 350. Spray a Bundt pan lightly with oil. In a small bowl, mix together the flour, salt, baking powder and baking soda. In a large bowl, blend the olive oil, agave nectar, water, lemon juice, zest and vanilla extract. Mix the dry ingredients into the wet ingredients and blend just until the lumps are gone. Pour into your Bundt pan and bake for 30 minutes or until a toothpick comes out clean. Cool the cake, invert, dust with powdered sugar and serve with fresh mixed berries or a simple compote. (To make a compote, toss the berries in a bowl with a generous squeeze of lemon juice, a pinch of salt and agave nectar to taste – let sit for 15-30 minutes to allow the berries soften and release some juices). This cake is definitely best when served on the same day it’s baked. Be sure to ziplock and refrigerate the leftovers to keep it moist. Enjoy! 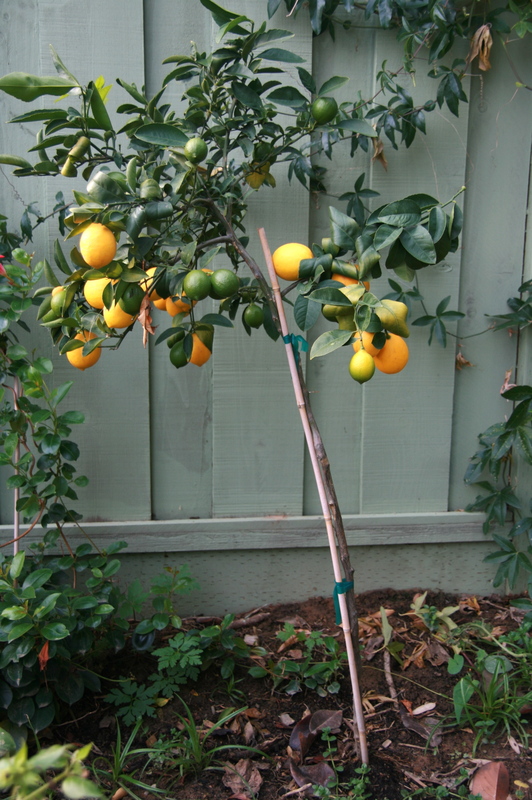 How is it possible that my pencil-thin Meyer lemon tree produced approximately 8000 lemons this year? And how is it still upright?! Looking for an incredibly tasty, unique breakfast (or dessert) treat with exotic flavors? This delicious, healthy dish will do the trick! Toasty notes of roasted nuts, coconut and wheat berries are beautifully balanced with warm cinnamon and bright little bursts of tangy pomegranate. Toasted fennel seeds add a dash of mystery on the palate with its faint hint fragrant licorice. Mmmm, this dish is so yummy and unlike anything you’ve ever tried! A bowl full of this high-protein, fiber-packed goodness will satisfy your taste buds, your belly and your whole body. I’m not exactly sure what to call this dish (hence the lame name I’ve given it). A Syrian friend once made it for me many years ago and I’ve long forgotten the name. She told me it’s a dish that her family made for special occasions, but she always had some in her fridge to eat for breakfast; she also liked to spoon over yogurt and ice cream. I became an instant addict and have been making it (and modifying it) ever since. In addition to the trio of toasted nuts, its other main ingredient is the all mighty wheat berry. 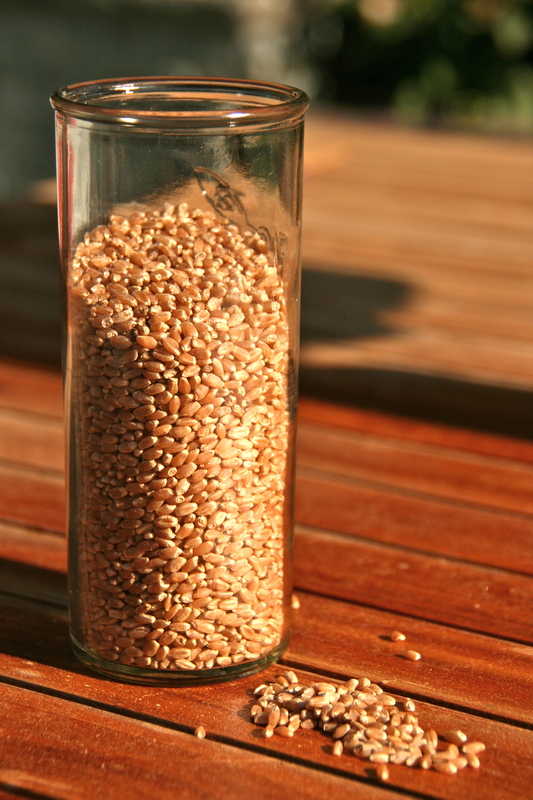 This little super grain is an unprocessed wheat kernel, which is packed with minerals, fiber and vitamins. 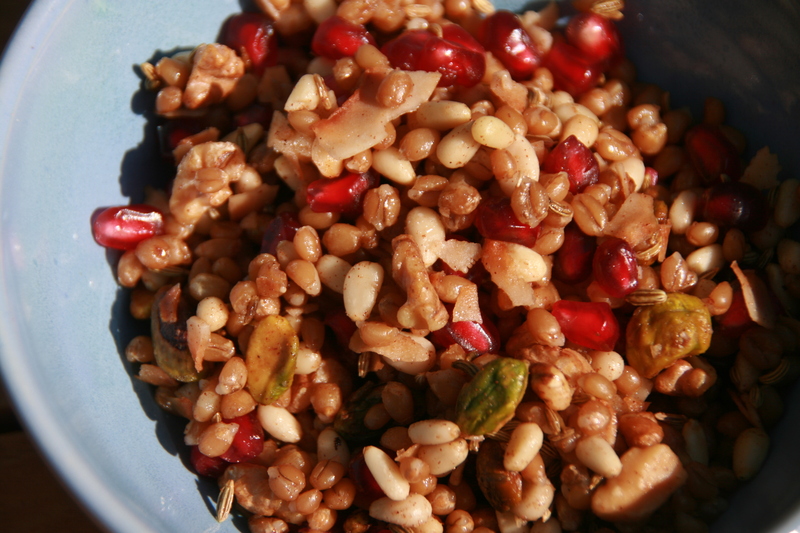 In addition to lowering your risk of various cancers and heart disease, wheat berries have a lovely earthy flavor and a slight crunch – they’re really great in this dish. Best of all, this tasty treat is bejeweled with the fruit of my people: the luscious pomegranate, which is as delectable as it is good for you. Honestly, is there any better taste of fall than ripe pomegranates? 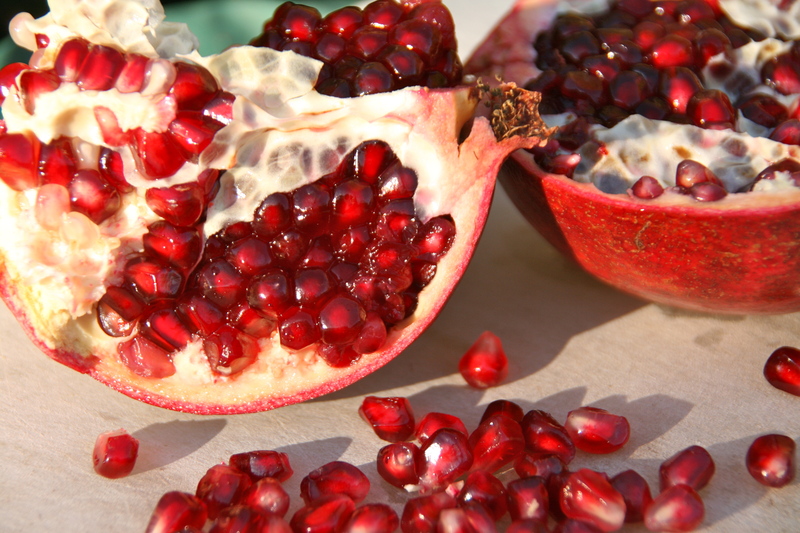 Well, I suppose there’s one: pomegranates that someone else has seeded for you – somehow, those always taste better! * if you can’t find pre-toasted nuts, just buy raw nuts and roast them in the oven at 350 for 10-15 minutes. First step is to soak and cook the wheat berries. These are tough grains, so soak them overnight, then add them to a large pot with about 5 cups of water. Bring to a boil, then reduce heat and simmer until the grains are tender, about 45 minutes. Then drain the wheat berries and put them in a large bowl. Meanwhile, heat your oven to 350. Spread fennel seeds in single layer on a cookie sheet and toast for 10 minutes. Spread coconut onto a separate cookie sheet and toast until golden, about 6-8 minutes. Add both to the bowl with the wheat berries. Add the pomegranate seeds, toasted nuts, cinnamon, brown sugar and salt. Stir well to blend, then serve and enjoy! It was close, but I’m happy to report that we survived Plumageddon! During a 3-week period every summer, our beautiful old plum tree dumps enough fruit to fill an Olympic-sized swimming pool. 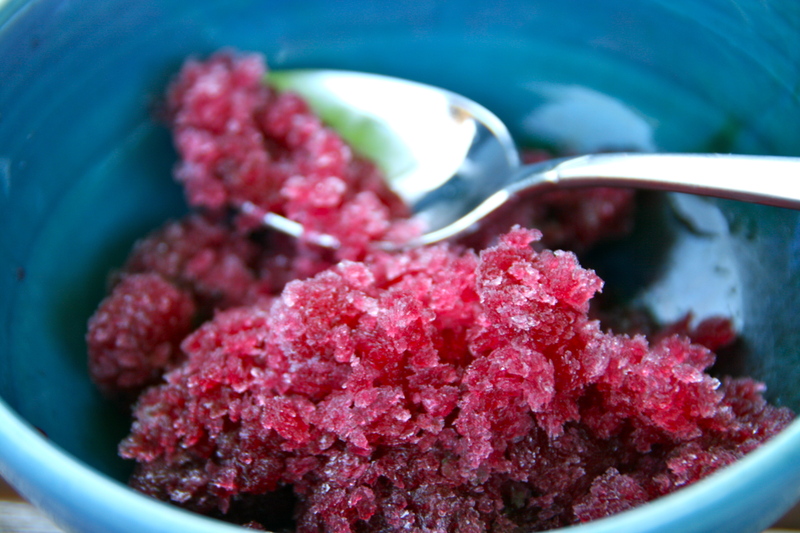 A few years ago, in a desperate attempt to put all the fruit to good use, I tried 14 plum recipes, and this one – elegant, vibrant Plum Granita – emerged as the Big Hit. It just sings summer! It’s my taste buds’ favorite summer song, and our friends request it more often than a 12 year-old asks to hear One Direction. It’s no wonder why this granita so popular – every spoonful of this icy delight bursts with the bright, sun-ripened taste of fresh plums. It’s got much more true-fruit flavor (and a lot less sugar) than sorbet, and its hint of fresh vanilla bean, allspice and cinnamon create a memorable melody of luscious flavor that will make you hum with joy. And bonus – it’s a healthy, fruit-filled alternative to fat-laden, dairy-based desserts. 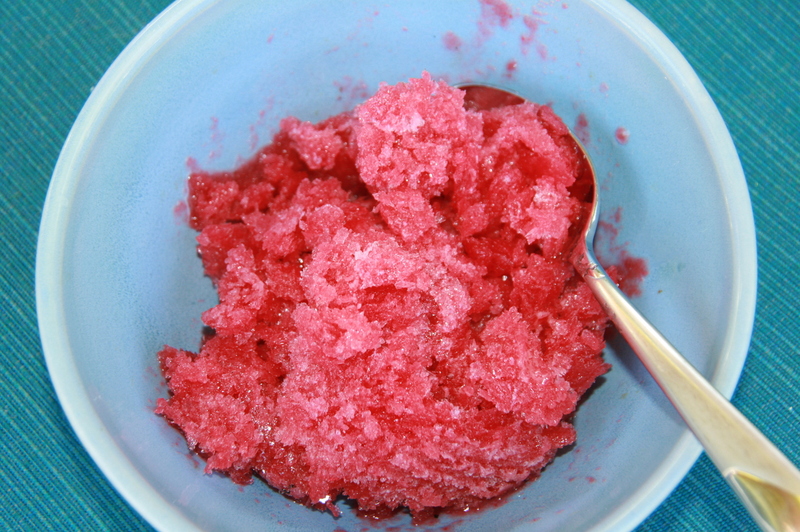 Plum Granita is a snap to make, and since it keeps well in the freezer, you can make a big batch and keep playing this hit throughout the year. In a small pot stir together water, sugar, cinnamon stick, and allspice berries. Slice the vanilla bean lengthwise, scrape the seeds and stir into the mix. Add the sliced vanilla bean as well, then bring the mixture to a boil, stirring constantly to dissolve the sugar. Once boiling, reduce heat to a simmer and cook, stirring frequently, until the liquid is reduced to about 1.5 cups. Cool the syrup. 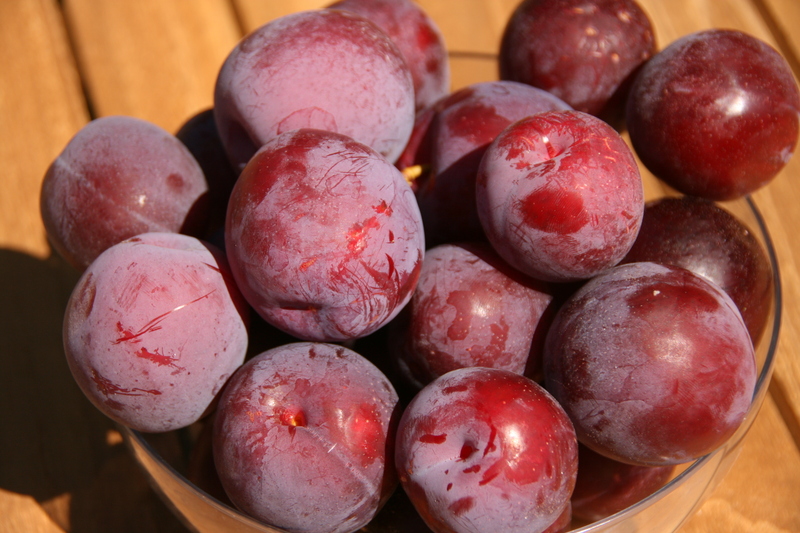 While the syrup cools, puree the plums in a food processor or blender. Place a sieve over a big bowl and press the pureed plums through it. This will fill your bowl with a thick liquid that looks kind of like a plum smoothy. Throw away the plum solids. Mix the cooled syrup into plum ‘smoothy’ and stir until well blended. Put the mixture into a Tupperware bowl and freeze for 1 hour. Then stir the mixture thoroughly with a fork, and repeat ever 45 minutes until you create a lovely, fluffy, light icy granita. Yum! Can you see the tiny black specks? Those are vanilla seeds, which add a heavenly, aromatic dimension to this elegant dessert. 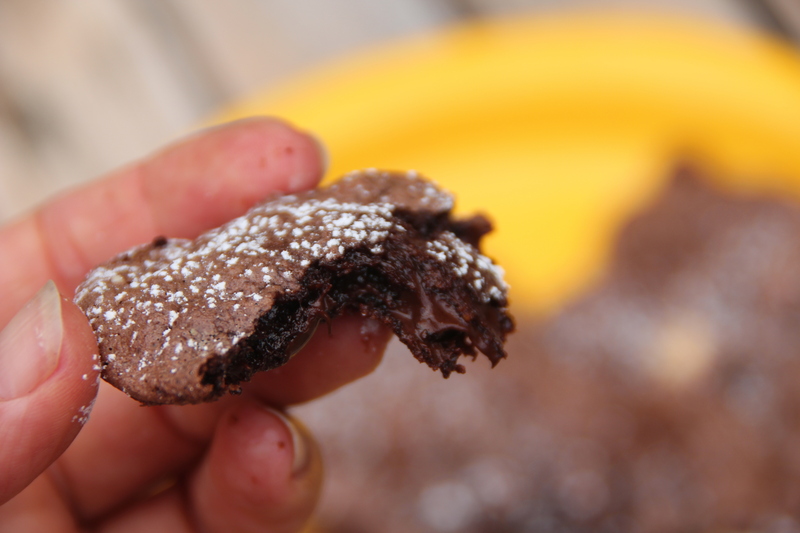 It’s a natural tendency to reach for a cookie when we’re feeling stressed out. In addition to providing a little respite, they also make great projectiles. But these tasty Vegan Spiced Oatmeal-Cashew-Blueberry Cookies (recipe below) aren’t like most comfort foods that provide only a fleeting moment of emotional anesthesia. 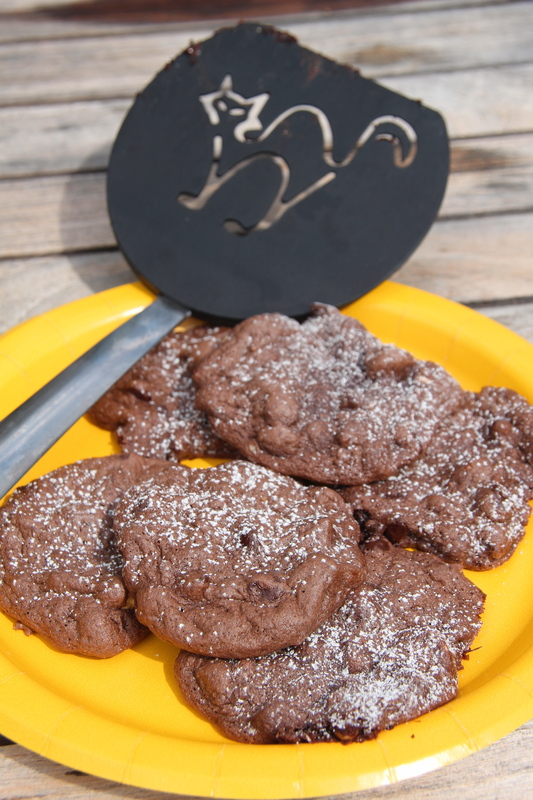 These cookies are actually packed with incredible ingredients that alter your brain chemistry to reduce stress hormones and increase the production of chemicals that will elevate your mood. Yes, it’s loads of fun trying to write articles with the pleasant sound of the jackhammer just inches away! Stress is a killer – literally. John knows four people who have dropped dead at his workplace in the past year. Yikes! So when I started seeing his brain-vein pounding more prominently in recent weeks, and when my legs began jackhammering at my desk (even when the demo guys were taking a break), I decided to do a little research about ways to combat our tension with food. Oatmeal makes your brain produce the “feel good” brain chemical serotonin. It modulates mood, helps us combat stress and makes us feel happier. Blueberries are high in vitamin C, which researchers have found reduces the psychological and physical effects of stress by curbing the secretion of cortisol. It has also been shown to help people bounce back from stressful situations more quickly. And bonus: blueberries are rich with anthocyanin, which improves cognitive function and memory. They’re also a source of potassium, which lowers blood pressure. So I figured: why not combine all these stress-busting, anti-anxiety foods into a delicious and healthy snack? Give these easy-to-make Spiced Oatmeal-Cashew-Blueberry cookies a try – they’re moist, delicious, addictive, and they’ll even help you suppress your urge to use one as a projectile. They’re so good that even carnivores who are fearful of anything vegan will love them. And since they’re packed with complex carbs (verses the empty simple carbs found in most cookies) and are super good for you, there won’t be any guilt-related stress if you happen to gobble up, say, all 25 of them in one sitting. Enjoy! * Whole wheat pastry flour is a little lighter and yummier for baking, but you can use regular flour if you can’t find the pastry flour, but if you do, just use a tiny bit less than ½ cup since regular flour is denser. 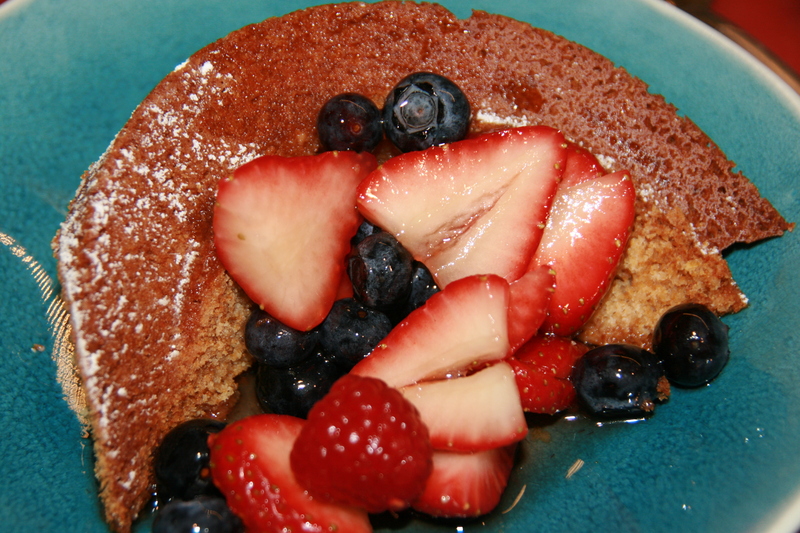 ** If you prefer, you can use 2/3 cup brown rice syrup in place of the agave nectar. But cut back on the salt to 1/8 tsp. The cookies turn out even chewier this way, and with slightly crispier tops. Preheat oven to 350. Prepare cookie sheets with parchment paper or a light spray of olive oil. In a small bowl, stir together flour, salt, baking soda and all the spices. In a larger bowl, mix the applesauce, agave nectar, vanilla and oil until blended. Then add in the flour/spice mixture and stir well. Add the oats, blueberries and cashews and mix until blended. Now let the mixture sit for 10 minutes – this will soften up the oats and make the cookies chewylicious. Using your cookie scooper or a spoon, create 25 little cookie mounds on your baking sheets and bake for 12-13 minutes, until the cookies are golden brown. Now here comes the hard part: wait at least 10 minutes before wolfing down the cookies. They hold together better after they’ve had a chance to rest. Plus, waiting will help you keep the flesh on the roof of your mouth! That used to be the case for my carnivore, but I’ve been working hard to change his mind. He’s finally realizing that vegan cupcakes aren’t dry, dirt-encrusted bricks wrapped in hemp leaves. Top bakers and chefs all over the world are recognizing the health benefits of desserts free of animal products and we’re seeing more and more incredibly tasty and inventive recipes from them. 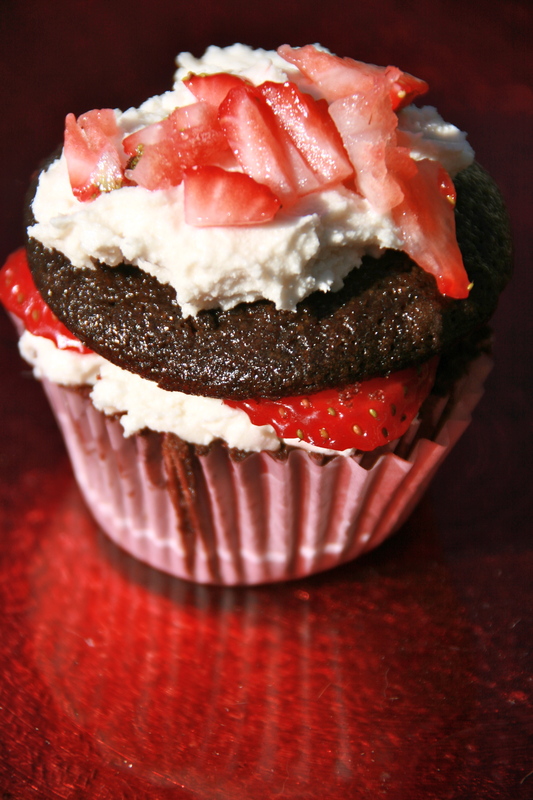 This vegan chocolate strawberry cupcake recipe is by chef Chloe Corscarelli, who used these yummy and pretty little cakes to win the Cupcake Wars competition. Most impressive: she was competing against people using whipping cream, butter, and every other animal fat you can imagine, and these amazing cupcakes kicked all of their booties. Score another point for Team Veg! With Valentine’s Day just around the corner, give these beautiful cupcakes a try and see if you can convert a carnivore or two yourself! Preheat oven to 350. Line 12-cup muffin pan. To make cupcakes: In a large bowl, whisk together flour, sugar, cocoa, baking soda and salt. In a separate bowl, whisk together 1 cup water, the oil, vinegar and vanilla. Pour wet mixture into dry mixture and whisk until just combined. Divide batter among cupcake cups. Bake until toothpick comes out clean, about 15-20 minutes. Let them cool completely in pan. To make frosting: Using an electric mixer, beat shortening, 2 2/3 cup powdered sugar and the vanilla to mix. 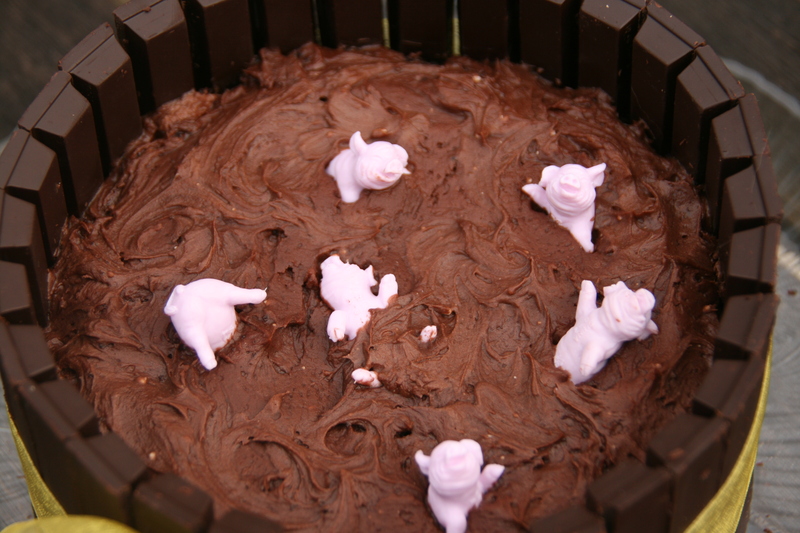 Beat in nondairy milk, 1 tbsp at a time, and beat until frosting is smooth and fluffy. Cut tops off of cooled cupcakes and set aside. 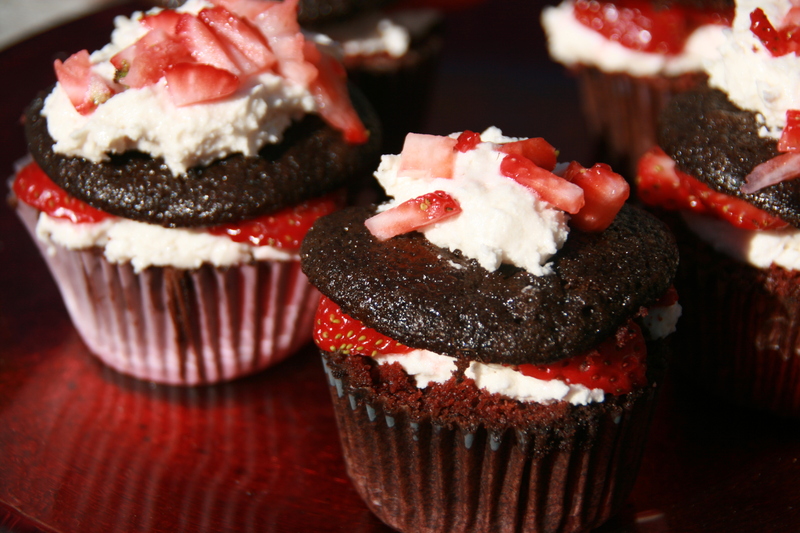 Smooth about 1 tbsp of frosting onto each decapitated cupcake and cover with a few strawberries. Replace top and then add a dollop of frosting and few slices of strawberries. Dust cupcakes with a little powdered sugar. Then enjoy! Have you ever seen the TV show “Chopped?” The host gives the chefs a mystery basket filled with a random assortment of oddities and they compete to see who can make the most delicious and creative dish. “Chefs, your mystery basket contains leftover pizza, pickle juice, bitter melon and an old shoe – you must use all these ingredients to create a stunning dessert.” I’m still not sure if I love the show because it’s hysterical to see the look of absolute horror on the chefs’ faces, or because they inspire me with their insane creativity. Either way, that show motivated me to create a pretty awesome “make it work” moment last night, which helped me trick my converting-carnivore husband into eating (and enjoying!) a non-dairy ice cream and a few servings of fruit – that’s a huge feat! So my mystery basket (otherwise known as my fridge) contained: extremely stale low-fat tortillas, blueberries, pomegranate balsamic vinegar, peaches and Coconut Bliss non-dairy ice cream. The challenge: get John to eat fruit and fool him into thinking he was eating real ice cream (so he wouldn’t give me “the face.”) Not an easy challenge! But I’m happy to report that the resulting concoction was spectacularly delicious and had a nice little surprise that kept my carnivore (and me) coming back for more. In typical Cimeron fashion, this dish is super quick and easy to make. (John and I have several “I’m so hungry I’m going to start gnawing on the couch” moments each week, so I often have to cook fast and simple dishes or else risk having teeth marks on my arm). And this dessert packs a nice punch of flavors and has some really beautiful texture combinations. There are two ‘wow’ elements in this dessert: one is the luscious balsamic peach-blueberry compote with blueberry syrup – the fruit is enhanced by a touch of balsamic vinegar, which adds just the right amount of acidity to balance out the sweetness of the dessert, and the flavor is simply addictive. 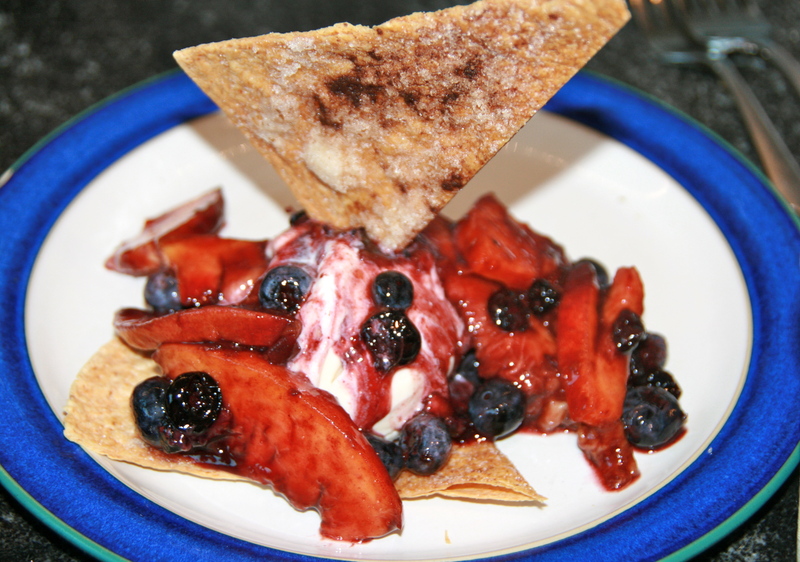 The other is the crispy, cinnamon-and-sugar baked tortilla triangles, which miraculously stay super crunchy even when soaking in the blueberry sauce! That was a lucky surprise. John loved breaking up the triangles and using the pieces to scoop up the “ice cream” and fruit compote, and I just couldn’t get enough of the lovely crunchiness of it. While we were licking our plates, John turned to me and said: “You have not been Chopped! Oh, and can I have more please?” High praise indeed. Meanwhile, slice up the peaches. Place them in a large bowl along with 1.5 cups of blueberries. In a saucepan, combine the remaining 1 cup of blueberries with the 2 tbsp balsamic vinegar and 2 tbsp sugar. While stirring constantly, bring to a boil. Cook until a nice syrup starts to form and about half of the fruit has broken down, about 1-3 minutes or so. 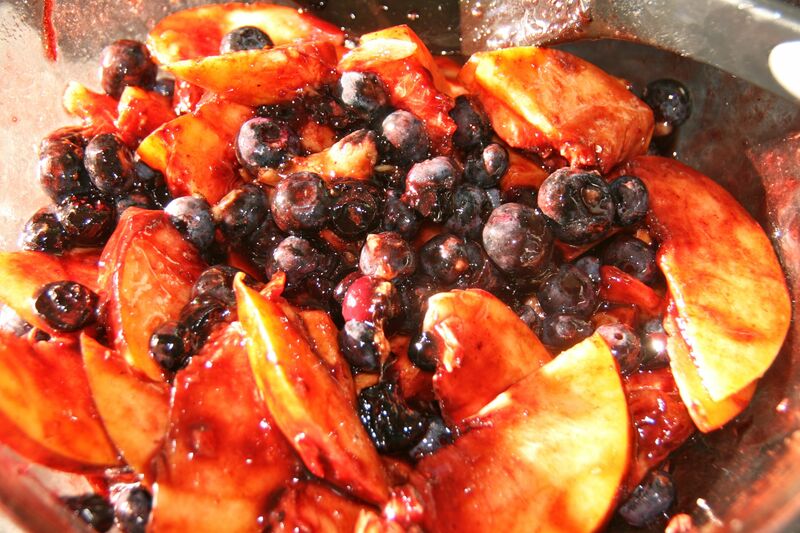 Pour the hot syrup mixture over the fresh peaches and blueberries and stir well. Let sit for 20-30 minutes, stirring once or twice while it’s sitting. Arrange a couple baked tortilla triangles on a plate and put a generous scoop of non-dairy ice cream in the middle. 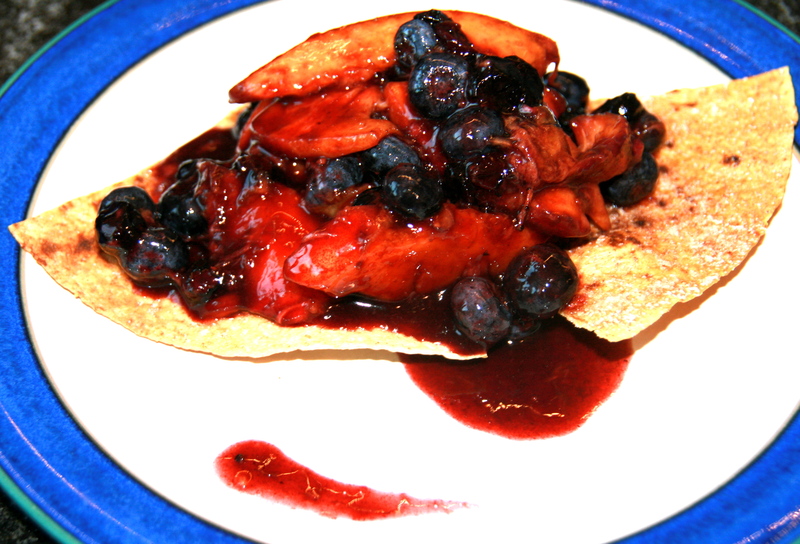 Top with big spoonfuls of the peach-blueberry compote and syrup. For a pretty presentation, take a baked tortilla triangle and plant it like a flag on top of the ice cream. Then watch it all disappear in an insant! Ah, pomegranates: the fruit of my people! Whenever I see them, I think of my sweet Persian mother and how we used to sit together and seed pomegranates for hours while laughing about the fact that we always put more pomegranate seeds in our mouths than in the bowl. The tiny ruby fruit-gems burst with juicy flavor and are simply luscious and divine! And it’s incredibly good for you, too – several scientific studies have found a surprising array of the health benefits of pomegranate juice, including its ability to: lower cholesterol, lower blood pressure, fight breast cancer, prevent cartilage deterioration (aka osteoarthritis), prevent lung cancer, slow prostate cancer, and even prevent Alzheimer’s Disease. 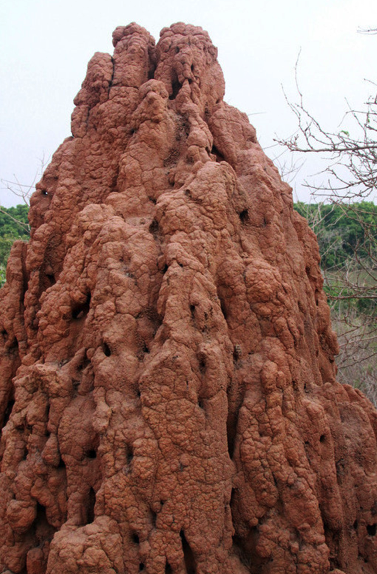 No wonder it’s consider a super-food! I can’t wait for the fall harvest of my favorite fruit, so I decided to create a super easy and truly delicious dessert that pays homage to my Persian mum…and also to my taste buds: Pomegranate-Lime Granita. The lime perfectly pairs with the pomegranate to give it a slightly citrus hint to tantalize your palate. This recipe also has a secret mission: to get my husband to consume more pomegranate juice. John loves this granita so much that he eats tons of it, which makes me happy since he’s getting plenty of pomegranate power in his dessert. 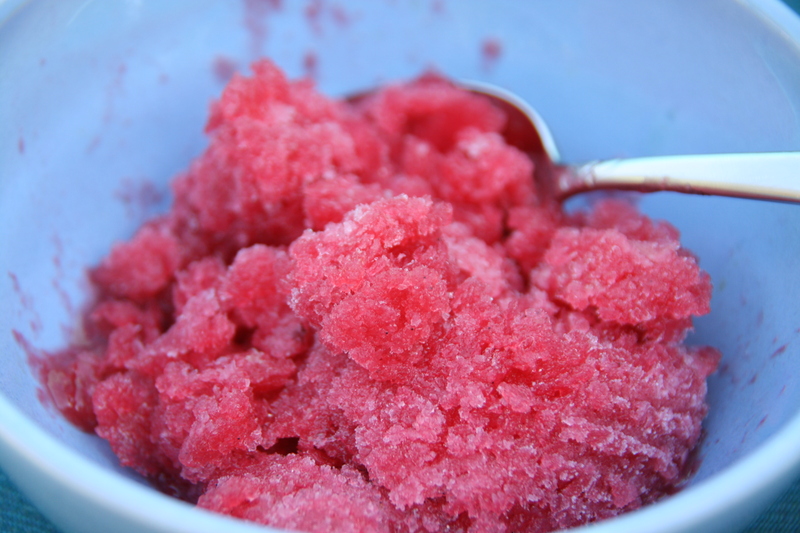 If you’ve never had a granita, it’s a light and refreshing frozen dessert. The texture is kind of between Italian ice and sorbet. I make mine fluffy since I like the crunch of fruity, icy crystals, but it’s just as easy – okay, it’s actually easier – to make it smoother. 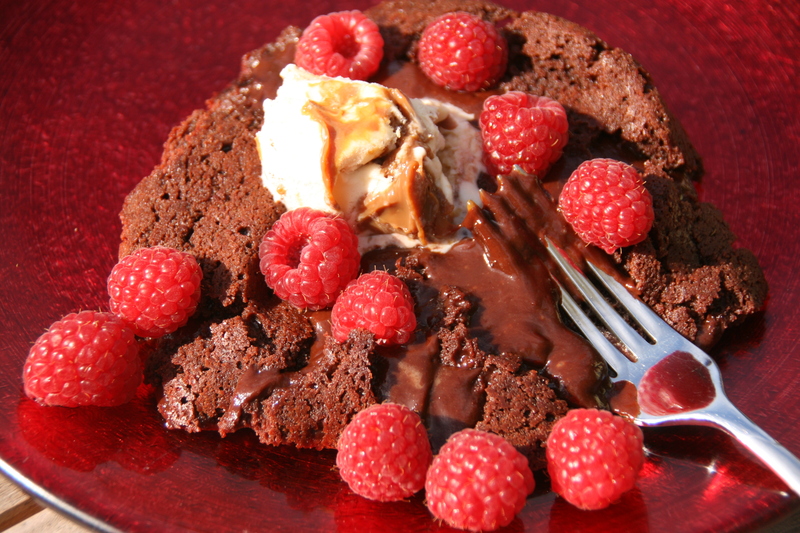 And bonus: this dessert is crazy-easy to make. Active time is less than 3 minutes. Who knew that creating a tasty and super healthy dessert could be so simple and quick? Try it let me know what you think! In a Tupperware bowl, combine all ingredients and stir until the sugar dissolves. Cover and freeze. 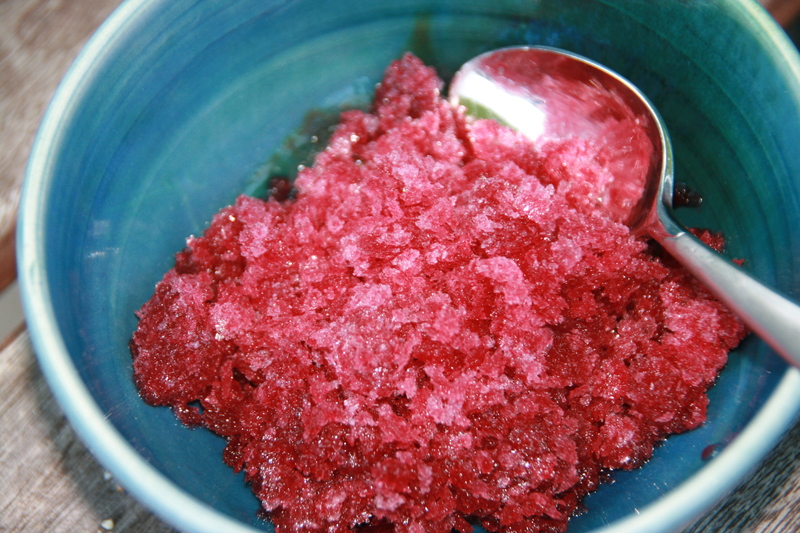 If you want your granita fluffy and more crystallized (like I have in the photo), mix it with a fork every hour or so while it’s setting, breaking up the frozen chunks. If you want it more firm or you’re just lazy (warning, you’d better have a sharp fork and a strong arm – it’s going to be quite hard), just let it set in the freezer and when it’s done, scrape it with a fork. On hot summer nights, I like to freeze my serving bowls so it keeps the granita nice and cold while we’re eating it.